Charlotte Moss and Frances Schutlz were at Madoo to talk gardens and read from their excellent new books. Get them both — they are wonderfully diverting. One of my favorite gardens by the beach is Madoo, which was founded by the artist Robert Dash back in the late sixties. I’ve been visiting this place for years and never tire of its extremely personal and heartfelt design. Mr. Dash died a few years ago, but The Madoo Conservancy has kept the spirit of the place very much alive, and they always have a number of events throughout the year to celebrate all that is wonderful about life in the garden. 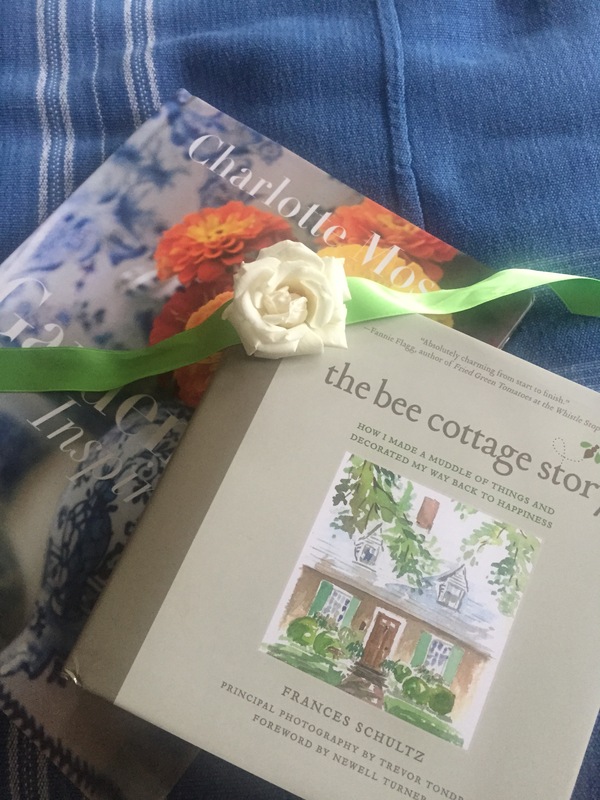 Most recently, Mr. H and I attended a lunch featuring a talk with Charlotte Moss and Frances Schultz about their love of a good garden and making a home. Since these are two of my favorite topics by two authors and designers that I adore, I was pretty excited at the get-go. And the day didn’t disappoint…. Who gives out corsages anymore?!? More importantly, WHY did we stop?? I think I would have left mine all day if the rest of my day didn’t include dog walking and making dinner. 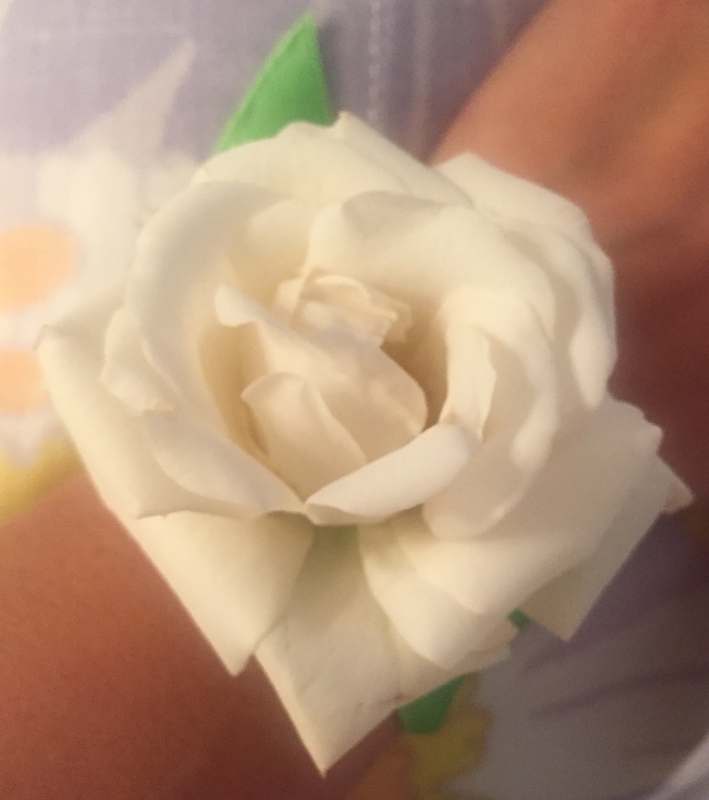 Upon arrival at the lunch, everyone was given one of these delightful corsages. Almost all the attendees were game enough to wear them, even the men, some of whom who nattily tied them to their belt loops. (Very chic.) Talk about setting the mood! It was the perfect, transporting little detail that is a hallmark of the place. Then we were treated to wine and nibbles under a tent-covered pergola (it was a slightly rainy weekend) that looked out onto one of the more formal parts of this rather informal garden. After some book buying and chatting, Charlotte and Frances read a bit from their excellent new books and then had a fun panel discussion about their life in the garden, which really isn’t very different from anyone’s — in the good way. I don’t really eat many sweets, but the pot de creme in a terra cotta pot could not be resisted. Charlotte was cool about my complete un-coolness and somehow I felt like it didn’t matter because (aside from the fact that there was probably some kind of security) we shared a love of gardens. Which is was what makes visits and events at Madoo so wonderfully different: There is no posturing, no looking to see “who’s here” or deciding who was wearing the best or worst outfit. 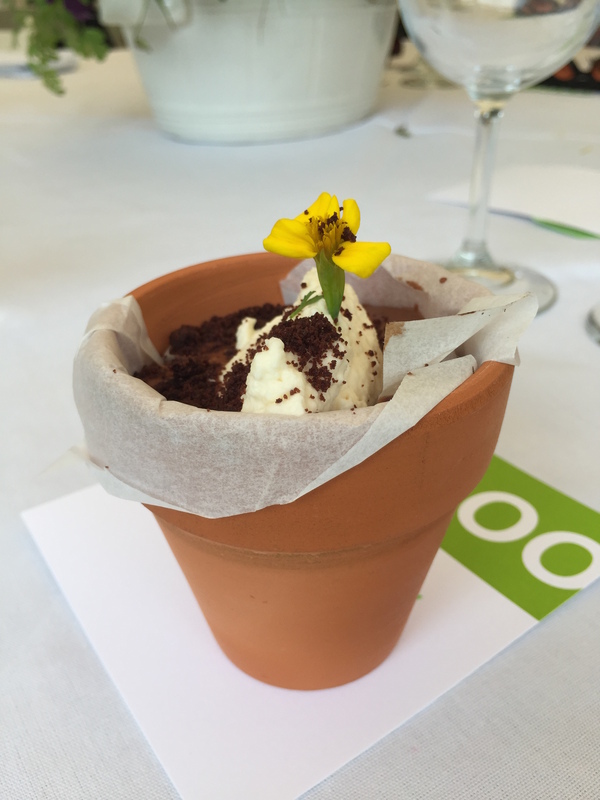 It is always about the garden…learning, sharing and connecting with people who have this one, marvelous thing in common. Given how easy it is to feel disconnected in these highly “connected” days, I find this to be a hugely comforting thing. 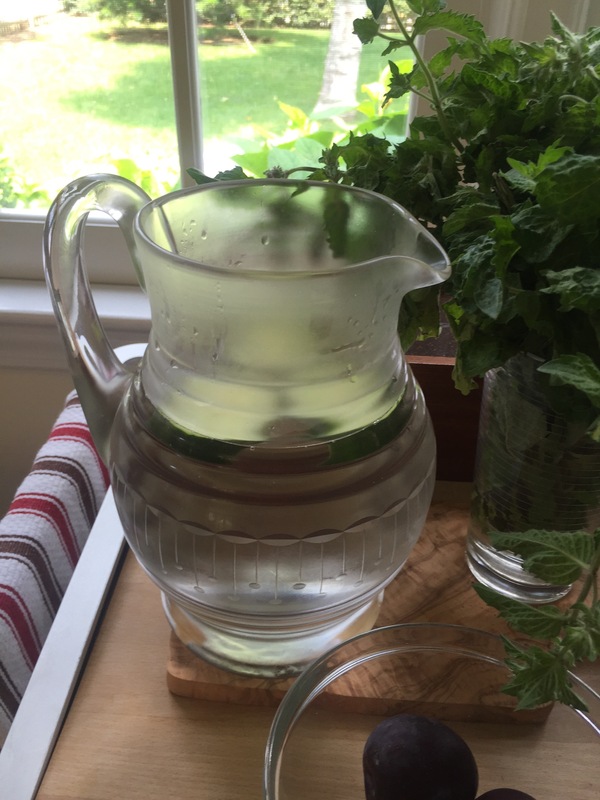 For instant refreshment, especially if you, say, are trying to run in the early morning and come back covered in sand and sweat, nothing is as lovely as cucumber water. Just add a few slices to a pitcher — preferably an attractive one — of filtered water and keep in the fridge. The slices will need to be replaced every other day or so, and that is it! We worked together a million years ago when she lived in New York and remained friends all these years later. She was the first person to take me to Takashimaya on 5th Avenue, where the flower shop on the first floor was always an inspiration. She also showed me how to tie a ribbon around a package without leaving that funny bump. (I promptly forgot.) And we had countless laughs at the nuttiness we experienced at work and in life when we were younger. I remember the madness of the week before her wedding. How pretty and happy she looked in the photos from that day. And how her husband looked at her with such love and affection every time I saw them together. I remember a wonderful afternoon we spent at the Philadelphia Museum of Art, where she later worked, and that she was expecting and that I brought her a little gift from Petite Bateau. We caught up on a bunch of things, including this new guy I was seeing…yes, it was Mr. H.
I also remember our last meal in the city where we had a great time but also she mentioned that she was sick…and that she would beat it. But tonight I so very much regret this fact. I could have visited her there. I could have invited her here. I always thought we had time, even though I knew that we didn’t, really. So, just a little reminder to take the time, be with the people who make you happy and who you love. It is important. Visual Fixture of my childhood. 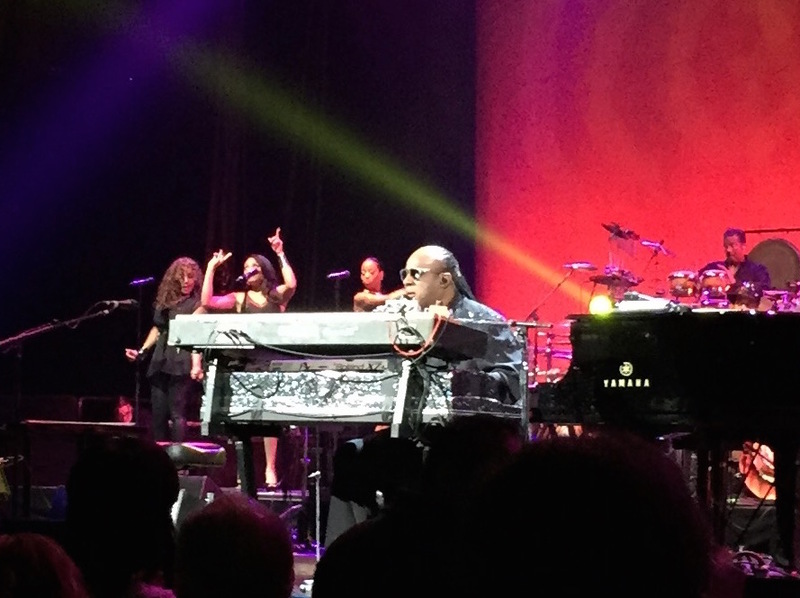 When I was working in entertainment — particularly during those years in music — I used to imagine what it would be like to meet Stevie Wonder if he say, happened to come into the office of the marketing department where I worked. Sometimes these imaginings would even come out of my mouth in meetings with my team…they all thought I was nuts. 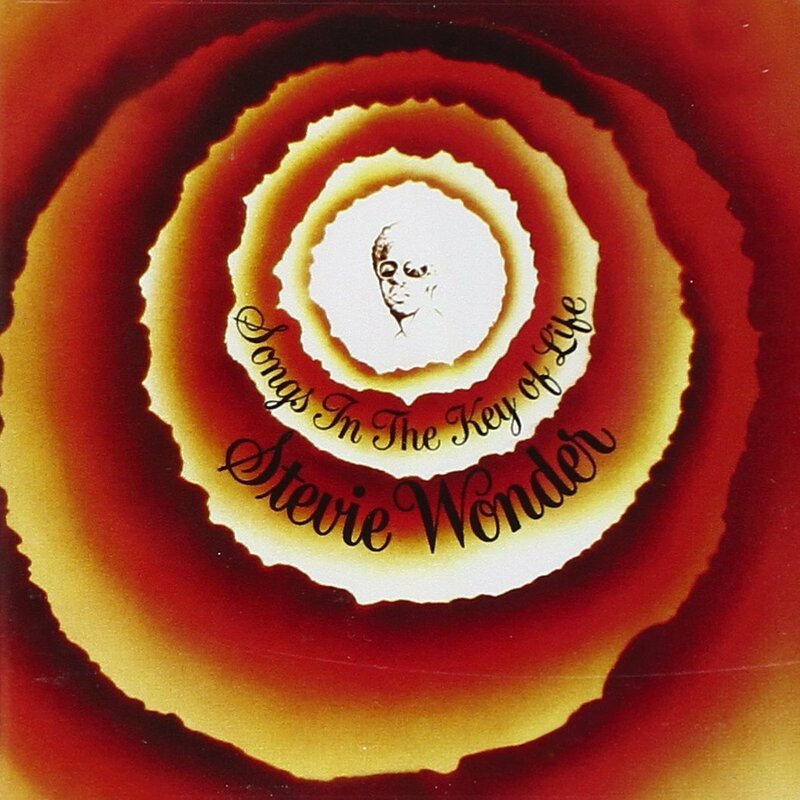 Needless to say, Mr. Wonder never came around the offices (especially since I didn’t even work at his label), but it was only a short 14 years later that he came to the Barclays Center to perform “Songs in the Key of Life” in its entirety for the occasion of its 38th anniversary. Needless to say, there was not way I was missing this show. And I didn’t. OMG! I am right in front of Stevie Wonder!! OK, John Slattery and a few others were between us, but still…I was very happy. As we were getting seated, I heard a tween say to her dad “I can’t believe that we are in the same room as Stevie Wonder!!”. I wholeheartedly agreed. And our seats were good — I am quite certain that this is as close as I will ever get to him — but the performance was even better. He performed the whole record through in about four hours. His voice is perfect, the (huge) band was tight and totally into it, and the audience was Not Too Bad graded on a NYC Curve. Really, there just isn’t much more to say except that I teared up a little when I heard him belt out the first few lines of “Love’s in Need of Love Today”, and almost lost my mind when he performed an encore mashup of everything else you would even want to hear, including “Living For the City” as one seamless piece that didn’t cheapen anything in it. Mr. Wonder bowing with this band at the end of the show. “We did it!” he exclaimed after they performed the final song. He just seemed so happy. And the final, perfect touch: He bowed with the band. Who does that anymore? Stevie Wonder, that’s who. * Which in my opinion, as well as that of my General Counsel who is also a musician, as a song is actually pretty good. It was just the eighties production that made it, well, less good. It is that time of year again: Fall/Winter Shopping. I know, I know….you are still not ready for summer. To be truthful, I would barely be ready if it wasn’t for the warm weather trip Mr. H and I tend to take in the middle of winter. Packing for that adventure generally makes me take stock in what I have for Warm, Hot and Burst Into Flames weather, and gives me a chance to fill in as needed through the Resort collections and careful picks from The Outnet and such*. It is also in those cold, horrid months that one actually gets to see the what the Fashion Gods would like us to wear during the following cold, horrid months. So while I am picking through my summer clothes, I am also thinking about what I wouldn’t mind having for later. Much later. This year there weren’t many collections that made my heart sing, mostly on account of my having something similar or everything seeming the same but maybe made less well than the one I bought five years ago. (What is up with that, by the way??). Not to mention that I am not dressing for the offices of Vogue every day, although I do try to Bring It on weekdays. One exception was by one of my favorite designers: Dries van Noten**. I rarely go a season without a little something from his collection, as his use of color alone is irresistible. And aside from casualties, like the gorgeous silk print top in shades of deep teal, rust and acid yellow that my former dry cleaner managed to irreparably and prominently damage, I tend to keep his things for a long, long time. Like the peach and red Japanese-inspired raw silk bolero that looks heavenly over a black dress from The Row that I picked up this winter. I think I purchased the bolero in 2005. It still thrills me. As such, I recently had a little Dries Attack, and picked up a few things, even though I swore I was good for the season just a few weeks ago. But for everything that comes in, I do believe that a few things generally need to go out. I am sure that many of you have heard about Marie Kondo’s book about organizing (http://www.amazon.com/The-Life-Changing-Magic-Tidying-Decluttering/dp/1607747308). While I haven’t made it through the entire book just yet, I got to the heart of the matter which is really about the Ruthless Edit (https://somecozynight.com/2012/08/11/wardrobe-experiment/). But rather than looking at it as an episode of any popular elimination show, Ms Kondo’s thinking is that if what you have isn’t “sparking joy”, you should thank it and then give it away. I will admit that this sounds a little odd, especially when one thinks about t-shirts and jeans — what t-shirts would “spark joy” for me? And why should I be thanking them? Still, I wanted to Change My Life by Thanking My Clothes Before Tossing Them. Even if it seemed extreme. So a few weeks ago, I began a major Kondo Method wardrobe purge, deciding if each item in my wardrobe (even unmentionables) was really making me happy, or if I was just keeping it “because”. As I started doing it, I began to realize that there really are pieces that I truly adore and others — way too many, in fact — I have for some unknown reason. But they had served their purpose at one time, and so honoring them with a small “thank you” made it easier to let them go. I’m finding a lot of granola bars. But not entirely, which is why I am not feeling too bad about the Dries Attack. Sometimes you just come across something that you know will love for a good, long time. Like it was made for you. 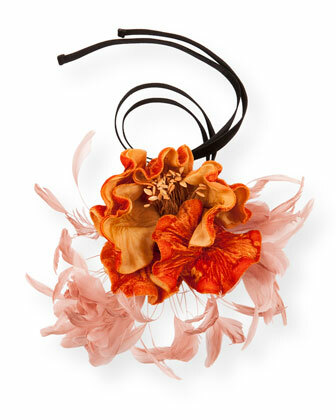 Such as that top in Look 1 and the kind of outrageous flower necklace pictured above. I just had to have them…they seem so special and so me…how could I resist? Well, I didn’t. They were sparking joy. * Seriously, The Outnet is fantastic — just stick to the things that aren’t “defining” looks and fabrics in a prior season and you will be golden — quite golden, since the prices can be darn good! **Like my love of high/low, I am also a fan of minimal/maximal — it just depends upon my mood on any given day, I guess. 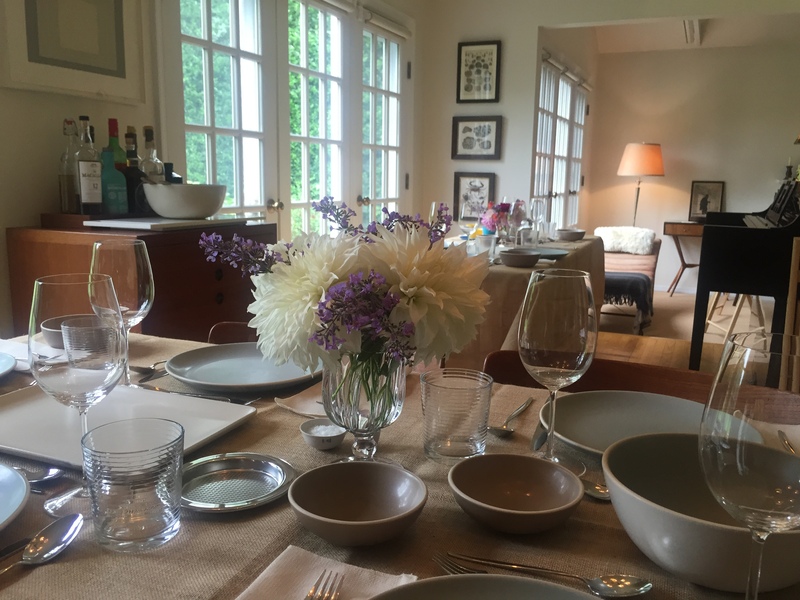 Mr. H and I hosted Father’s Day this past weekend for a total of thirteen people (including us and our two young nephews — and two dogs, who opted for chilling in our bedroom). In spite of the rain that put the kibosh on my tent and outdoor lunch in the garden plan, the day went off well and it even cleared up enough for our party to spend a little time outside later in the afternoon. So, overall, a win. But over dinner that night, somehow Mr. H and I got on the topic of how within just a few minutes, going to a place like Facebook can make you feel like your life is really not what it should be. This is a well-covered topic, and one that has given more prominence to the concept of the “Fear Of Missing Out” (FOMO), from which I suffer more than I care to admit. My life is largely — though not entirely — the product of choices that I have made. Choices of how I wanted my life to be. And when I am not busy looking around at other people, they are choices that I feel content with having made. So what’s up with feeling like I am somehow not “living up” to life?? I wish I knew. But what I do know is that when I feel a FOMO attack coming on, I try to remind myself that the digital world is not the real one, which is where I find the most comfort and happiness, even in its unedited version. And that really, Living The Life You Want (LTLYW…yeah, I made this up) is generally the best course of action if you have the privilege of doing so. It still doesn’t keep the FOMO away, but it certainly makes my time off of screens feel like I am exactly where I want to be*. * Unless I am somewhere that is really cold, really hot, smelly or otherwise unpleasant. June by the beach brings rain. Lots of it. So much so that my Father’s Day plans have been moved from the garden to the indoors, which is a bit of a bummer. That said, all this rain helps (I hope!) yeild the most lovely strawberries, which are now in their fleeting season. And while we have these berries every year, like wine, there are good seasons and less than stellar ones. The last year that was truly remarkable on the strawberry front was — wait for it — 2007. We had a different President and Facebook was just getting going. That is how long this non-fruit lover has been waiting for another incredible strawberry. But finally, in 2015, the time has come. Just the scent of them is dazzling. 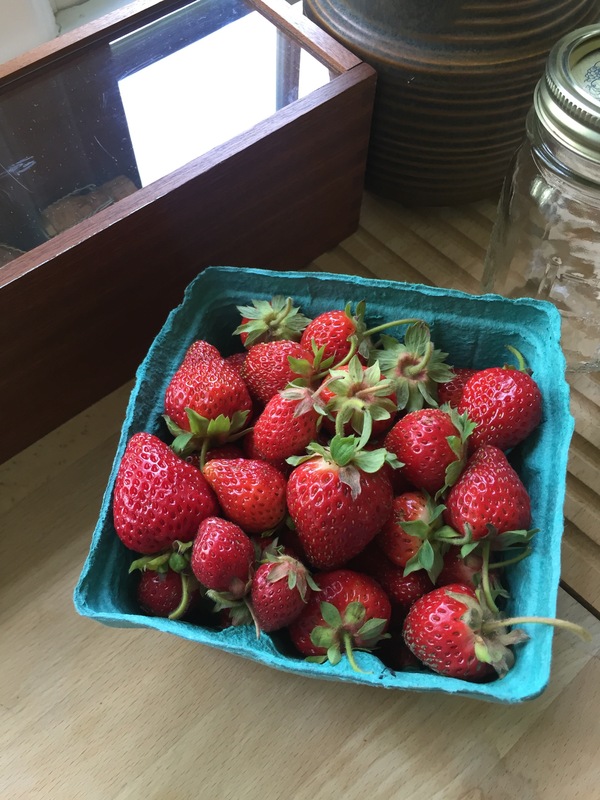 And apparently I am not alone in believing that 2015 is a very high quality year for our local strawberries: At a luncheon at our local garden conservancy today (featuring a talk with Charlotte Moss and Frances Schultz — post TK), my table mates and I were all marveling at this year’s crop…and also wondering aloud if maybe this season’s peaches would rival the ones of ’05. Only time will tell. I guess we’ll all just have to be patient and savor what we have in the meantime. You are currently browsing the Uncategorized category at Some Cozy Night.